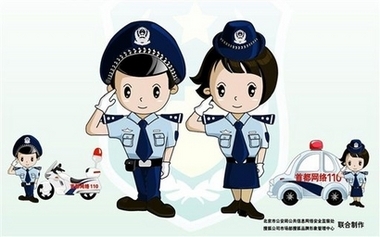 Police in China’s capital said Tuesday will start patrolling the Web using animated beat officers that pop up on a user’s browser and walk, bike or drive across the screen warning them to stay away from illegal Internet content. Suddenly the phrase “blue screen of death” takes on a whole new meaning. Oddly the police aren’t wearing Google or Yahoo logos. C’mon, guys! Sponsorship opportunity! This entry was posted in Beijing, Censorship, China, Chinese Socialist Realism, Chinoise, Police. Bookmark the permalink.